A new 3D augmented reality app that allows users to visualize and create virtual Appalachian gardens has launched and its developers hope it will both educate and inspire nature lovers. Maria Harrington, an assistant professor of digital media, along with Zack Bledsoe ’18, Chris Jones ’18, and Alexandra Guffey, created The AR Perpetual Garden App in conjunction with Carnegie Museum of Natural History’s Powdermill Nature Reserve and the Multi Media Technology program of the Salzburg University of Applied Sciences. 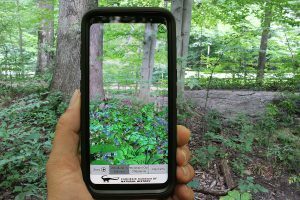 The app enables users to visualize botanically correct 3D plant models through AR-enabled smartphones and devices and was designed to provide a more immersive experience for visitors to Powdermill Nature Reserve, the environmental research center of the Carnegie Museum in Pennsylvania.